A cosy and versatile hotel in the best location in Hämeenlinna city centre. Enjoy the bustling city, comfortable rooms and good service. At the end of the day, relax in the sauna or swimming pool or enjoy the delicacies in the restaurant. The hotel is a cosy place to relax and offers versatile services. Our fresh and bright rooms cater for all needs. The rooms have comfortable beds and all you need for a good night’s sleep. Our friendly and helpful staff ensure that you don’t have to worry about a thing. In our charming restaurant, you can enjoy a breakfast buffet and a delicious dinner. Have a drink or two in the comfortable local bar, browsing the daily papers. Organise both traditional conferences and smaller events in our bright conference rooms. The hotel offers WiFi, a sauna and swimming pool and a 24-hour shop. You can borrow a bicycle from reception. 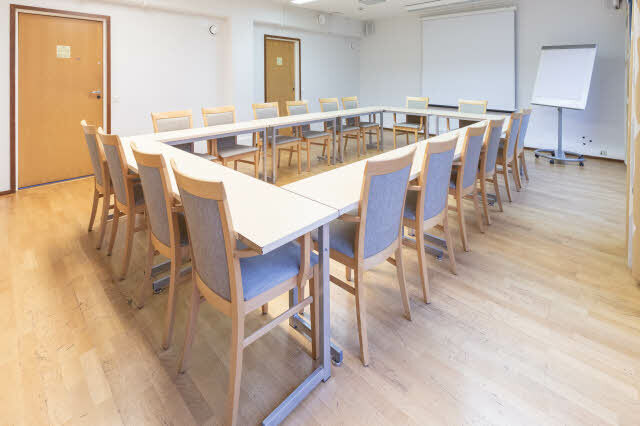 It’s easy to arrive at and leave the hotel, as it’s located in the heart of Hämeenlinna, along the pedestrian street Reska and a short walk from the bus station. Explore the city’s shopping opportunities and other offerings close to the hotel. The hotel is in a good location for exploring both the city’s busy cultural life and Aulanko’s beautiful natural landscape. The most popular sight in the area, Häme Castle, is only a short walk from the hotel. The hotel will be closed for Easter on 18 April and is opened again on 23 April. You have access to our comfortable saunas, swimming pool and to our partner’s paid gym near the hotel. If you prefer outdoor exercise, we can advise you on the best routes in the nearby area. With us you don't need to worry about parking. There is both a paid parking area and a parking garage available to our guests. Enjoy a breakfast buffet and a delicious dinner in our hotel restaurant. Also, stop by for a drink at our comfortable bar. It's difficult not to feel welcome. Organise effective meetings and events for up to 40 people in our bright meeting facilities.